Ten years ago, the idea of writing a biography of a YouTube celebrity gym goer would seem like the most ridiculous job in the world. At that point YouTube had stars, but they were usually famous for embarrassing or weird videos, and viral content. Ten years ago Instagram didn’t even exist, so the idea of writing about an Instagram celebrity was even weirder! But today neither of these things seems crazy. YouTube, Facebook, Twitter, and Instagram have turned the celebrity world on its head. Many people will not have heard of Bradley Martyn, but in his own way this guy is a celebrity. Bradley has 1.5 million subscribers on his YouTube channel, 2.8 million followers on Instagram, and 2.9 million Facebook followers. If that’s not celebrity level fame then what is? Bradley was born in 1989 (according to 90 seconds of in depth Google research) and appears to have led quite a difficult life. Family tragedy, and battles with mental health, have impacted on Bradley’s life, and he has been quite open about them . He got into bodybuilding in his teenage years, and slowly graduated into personal training, and then he turned to physique competitions. His YouTube videos began to attract a lot of followers about 3 years ago (2015) and through regular content and entertaining subject choices he has continued to build his fan base. His Instagram started in 2012 and has been a textbook example of how to appeal to gym bros. Seriously, if there was a University course on how to build a YouTube or Instagram page for fitness lovers, then Bradley Martyn would be teaching it. His physique is absolutely astonishing, seriously. This guy is what modern professional bodybuilders should be attempting to look like. Because the general public is just not responding to their physique in the same way. If you typed in “comic book character body” into Google, Bradley Martyn’s name should be first up. Right, that’s enough compliments … Let’s see if he’s taking steroids! 5 Is Bradley Martyn on Steroids? 7 How to Gain Muscle and Strength without Steroids? Anabolic Androgenic Steroids (AAS) are natural and synthetic androgens that can help build muscle. Anabolism is the process of building complex molecules from simple ones. Anabolism is the process that builds bigger muscles from smaller molecules. Anabolic steroids cause protein synthesis and insulin release, which helps to build bigger muscles. Testosterone is a natural steroid hormone that is produced in the body. People with more testosterone can build more muscles. There are many ways to naturally increase testosterone, but only to a certain degree. Bodybuilders, athletes, and physique competitors will already be doing all they can to maximise their natural testosterone levels (sleeping lots, exercising, following a testosterone boosting diet). But they will want to increase testosterone levels further still. There are several types of steroids out there, that have different goals. If you thought that anabolic steroids were all the same prepare to have your mind blown. There are steroids that are designed to help you increase muscle size and strength such as testosterone and Trenbolone. Then there are steroids that can help you to cut (lose body fat), an example of a cutting steroid would be Clenbuterol. Finally there are steroids who’s main purpose is to improve performance, these are the steroids that athletes usually get caught for taking. The fact that there are many different steroids out there, with different goals completely changes the narrative of why people juice. It also means that people can take steroids, without looking like they take steroids (if that makes sense). If you’re taking testosterone to improve your power for sprinting, then you aren’t necessarily going to look like the stereotypical image of a steroid-taking bodybuilder. This means that ripped dudes can be taking steroids, as can big fat powerlifters, and massive bodybuilders with incredible traps. There are many benefits to taking steroids, and some well documented side effects too, so in the next couple of sections we are going to take a look at both of these. Steroids can significantly improve your recovery from exercise. Shortening the required time to recover between sessions, and improving the benefits of recovery. Enhanced protein synthesis, not only the amount of protein synthesis that occurs but steroids can push the threshold. A non steroid-assisted lifter could eat just as much protein as a bodybuilder but not be able to use half as much for protein synthesis. Increased strength and size. Bigger muscles, bigger lifts. All thanks to increased recovery, and enhanced protein synthesis thanks to a huge increase in testosterone. Boosted metabolism means less body fat. Steroids are fantastic for dropping body fat and this can happen without even increasing exercise thanks to your enhanced metabolism. Improved endurance, improved performance in the gym. Bodybuilding and physique training is all about building muscle through metabolic stress and mechanical tension. Steroids can help you to get optimal amounts of both by hitting more reps at a higher weight. Improved libido … Say no more! There are many other benefits to taking steroids, and it’s not all talk . Studies have indicated that just the process of taking anabolic steroids is enough to increase muscle mass and burn excess body fat. Let’s be clear, we’re talking about taking steroids and sitting on your couch for 6 weeks and STILL seeing muscle gains! But the main benefit mentioned above is the ability of steroids to help you train harder and more often. Non-steroid taking people couldn’t possibly spend 3 hours training each day, their cortisol levels would be through the roof. More time spent in the gym, faster recovery, and a greater ability to build muscle all give steroid takers a huge advantage over regular folk. If you believed certain hysterical articles in newspapers or the portrayal of steroid users on television you would be forgiven for thinking that anabolic androgenic steroid use was worse than crack cocaine use. But it really isn’t. As with most drugs, the many side effects of steroids were embellished. Or maybe that’s not quite the right word, they were stated as an inevitable reality, rather than something that could happen. For the record, many steroid users will experience side effects from taking anabolic steroids. This is almost always down to not taking them properly. Some of the true geniuses in bodybuilding (and no that’s not an oxymoron you snob!) managed to take steroids for decades without any real side effects. Because they knew what drugs to take that will counteract the side effects. Still, we’re not going to pretend that steroid use or abuse is a risk-free practice. We’re just trying to balance the ridiculous comments that get thrown around. As some bodybuilder once said (complete paraphrasing here) “If people talked about the side effects of an aspirin in the same way that people talked about the side effects of steroids, nobody would ever try to treat a headache again”. Potentially cancer. Anabolic steroids are listed as “potentially carcinogenic to humans”. There isn’t much evidence yet, but it’s definitely a possibility. Hypertension. Anabolic steroid use can increase blood pressure, this can also lead to a loss of eyesight. It can also lead to cardiovascular disease, which steroid users are particularly at risk of. Acne. One of the most commonly mentioned side effects of steroid use is acne on the face or on the back, shoulders, chest, and arms. Gynecomastia. The formation of breast tissue in men, which is caused by an increase in oestrogen after an enzyme called aromatase increases production. There are other side effects and dangers associated with steroid use , but we’re already in danger of straying off target here. So let’s get back to Bradley Martyn. Many people think that they can spot a steroid user a mile off, but as we mentioned earlier steroids can be taken for many different reasons by many different people. Also, people who know what they are doing are much less likely to display gynecomastia or acne. Because they know how to prevent it in the first place, or how to treat it when it occurs. With someone like Bradley, if he is taking steroids he’s going to have learned how to from the best. He shows no signs of gynecomastia, nor does he have acne on his face or back. He isn’t suffering from hair loss either, and his mood swings (if they occur) are definitely not caught on camera. So how would you look for steroid use in someone like Bradley? The first thing that you should do is use a bit of objective reasoning. Look at known steroid takers, and compare physiques. Does Bradley look like known drugs takers? Another indication would be how much muscle he has gained over a period of time. Bradley has shown images of what he looked like before he started training, and images of what he looks like now. You can compare the two and estimate whether this was achieved naturally or not. Big traps, huge arms, a ripped set of abs, all signs of someone who works hard in the gym … but they can also be signs of someone who takes steroids. It’s up to you to decide which one this is. After looking at progress photos from Bradley’s past, and seeing how hard he works in the gym, it seems very likely that Bradley Martyn takes anabolic steroids. His physique is not unnatural in the way that a bodybuilder’s physique would be, but it is so much more impressive than what somebody who was unassisted would be able to achieve. Seeing someone who’s arms are so impressive, who has a chest as large as Bradley does, and yet maintains a year-round, single figure, body fat percentage. It would be incredible, nearly miraculous if that was achieved without a steroid cycle. Of course, maybe Bradley is the exception that proves the rule? Perhaps he gained 20kg of muscle in less than 7 years through eating lots of chicken breast and praying to Lord Arnold each night. It just seems unlikely. But whether Bradley Martyn takes steroids or not shouldn’t matter. It doesn’t matter whether Bradley Martyn took steroids or not, it’s crazy that anyone cares either way. It’s like asking if Snoop Dogg smoked weed in the 90s. Yeah technically it’s illegal, but in the right hands, anabolic steroids can be a powerful tool. Bradley Martyn does not compete in professional sports, nor even amateur sports (as far as we know). He is not seen as a role model for small impressionable children. Nor does he promote the use of steroids, not directly anyway. Steroids may make a physique like Bradley’s possible, but they don’t lift the weights for him. They don’t force him to eat properly, nor do they motivate him to go to the gym day in day out for years on end. That’s the mistake that people make about steroids. They can help you get massive in the same way that owning a frying pan can help you cook a stir-fry. You have something that makes your work easier, but it’s not going to literally do the work for you. Nor does it invalidate your results. If Bradley Martyn has gained some benefits from using steroids fair enough, the amount of work he has put into building himself up from nothing is still an impressive feat that few of us will ever top. How to Gain Muscle and Strength without Steroids? You don't have to use steroids to gain muscle, there are other methods available. For a start, you will need to increase the intensity of your workouts, while ensuring you get adequate nutrition from your diet. While nothing is as effective as anabolic steroids for muscle growth you will find that there are legal alternatives available that offer numerous benefits. 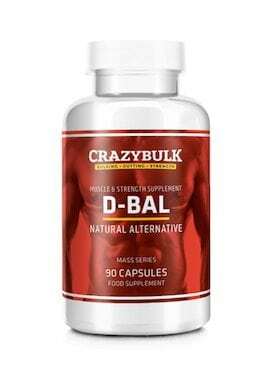 Our favourite choice for legal steroids is a company called Crazy Bulk, who sell a range of alternatives that include D-Bal, a safe and legal alternative to Dianabol. D-Bal is made from proven ingredients like BCAAs, Whey Protein Concentrate and Tribulus Terrestris, which can help to increase nitrogen retention within your body. This, in turn, helps to increase protein synthesis. There are plenty of testimonials available to prove these claims. If you are in any doubt just visit the Crazy Bulk website to read them yourself.